Another flower in Armin's lapel. Armin van Buuren's been on top of his game for quite some time now, selling out shows all over the world and grabbing the attention of over 15 million listeners every week with his "A State Of Trance" radio show. But occasionally his world-famous brand name takes a backseat in favour of pseudonyms. Many of them, such as Perpetuous Dreamer and Darkstar, have fallen to the wayside, but of the ones left alive, Gaia is definitely quite active. Though recently portrayed onstage by a pair of monks that barely move while the music plays, Gaia is Armin's love project for more heartfelt straightforward "pure" trance. 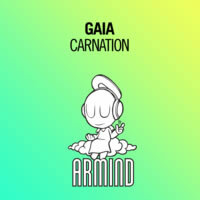 His latest (at least at the time of this writing) is "Carnation", a brand new anthem first appearing on Armin's 2015 iteration of his annual "A State Of Trance" compilation. It's also available separately as a single with only one track at your disposal: the almighty Original Mix! It starts out at first with a standard trance build-up until that power bass hits you like a brick to the femur. If you listen to it for too long, you'll probably induce a headache, but luckily it doesn't overstay its welcome before the main melody drops suddenly. It's quite catchy and quite angelic at first, later building and expanding upon itself slighty by adding harmonizing bass. Even later on, he adds a second underlying saw wave melody to intensify the song. If you are familiar with Gaia's other recent works, you know the project is meant to throw epic melodies your way; Carnation does not disappoint in that aspect. The song is actually quite powerful and worth your while. It won't be the most inspiring track you'll ever hear, but it definitely works for fans of "epic" trance, if that genre actually exists. If you've been a fan of Armin's works in the past five years, then delay not and add Carnation to your music library!